The peacefulness and beauty of the nature surrounding Kaldbakskot, elevated with fresh air from the ocean, is unique, still only one kilometer away from urban Husavik town. Therefore our goal is to provide our guests with environmentally friendly cottages. Procedures are to clean and wash with fragrance free detergents and earth friendly chemicals. This is to suit people who suffer from allergies, respiratory problems or chemical sensitivity. Our ambition is to keep the indoor air in our cottages free of fragrance, mold, chemicals, smoking and solvents. Chemicals and cleaning agents in our daily live, can be hazardous to our health and often is the cause of symptoms such as headaches, restless sleep, muscular pain, fatigue..etc. 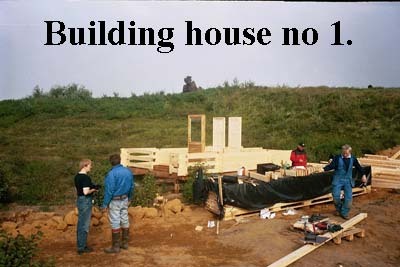 The houses are all natural solid wood from Estonia where forestry is under control, supervised and certificated by EEC. They are built with natural, solvent free, and non-toxic building materials , with minimal negative human impact. The downies and pillows are washed frequently at 60°C. The linens are synthetic to minimize the growth of mold, mildew, dust mite, bacteria and viruses. The floor has no carpet, only small “cozy mats” which are machine washed frequently. Since we at Kaldbakskot realize that "clean" does not have a "scent" we only use fragrance free chemicals. When you enter our houses you might smell the sulfur from our hot water which we used to clean your house. We try our best to keep our houses allergen-free to suit people with allergy and asthma. We use bromide to keep the two jacuzzi hot spas clean and clear, but the wooden hot tub has constantly natural geothermal hot water running into it and that keeps it clean. The temperature of the hot tub varies between 36°- 41° C but the hot spas should stay at 40°C. 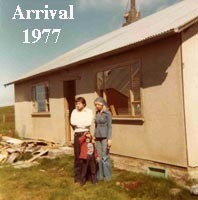 It was the year 1977. Sadat met Begin in Israel. The first personal computer, "Commodore PET", was demonstrated in Chicago. Jimmy Carter became president in the USA. Deng Xiaopeng was restored to power in China. Elizabeth II celebrated her silver jubilee as queen and Led Zeppelin's last concert tour in USA. This is the year when we graduated from the Univeristy of Iceland, Snædís, as a lawyer, and her husband Sigurjon, as a dentist. We were under the influence of the hippie culture, characterized by peace, concern for the environment, and rejection of Western materialism, and the dream was to move away from the capital, Reykjavik. We heard that there was a shortage of dentists in the small town Husavik in North Iceland. 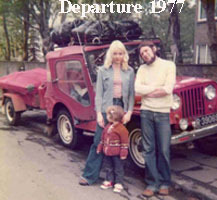 So in August we packed all our household things and our three years old daughter in our Willys Jeep and started our journey to Husavik. Sigurjon worked as the local dentist and Snaedis as a lawyer at the sheriffs office. We discovered an abandoned farm Kaldbakur, south of Husavik, fell in love with the place and bought it. The land surrounding the farm was very poorly vegetated and eroded, due to overgrazing for decades, but the view was unbeatable. Our first work was to put up fence all around the farm to keep the sheep away and plant trees. After a hard work for 25 years the surroundings have changed dramatically. In the year 2000 we met some Estonian musicians, that worked here in Iceland. They were surprised that no log houses were to be seen in the country. 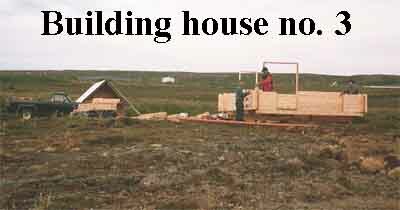 We ordered some log houses with the intention of selling them, but the market was not interested. At the same time Sigurjon was on the community counsil of Husavik and made a proposal that the area around the lakes at Kaldbakur would be designed for summerhouses. That idea was rejected, so we asked ourselves: Why always tell people about good ideas and expect them to carry them out? Why not do it ourselves? And we did - and now there are eighteen small cottages on the farmland. Snaedis is now running the accommodation business after quitting at the sheriffs office in 2002. Her husband Sigurjon is still one of the local dentists, but in the summer he has the status and title of a bell-boy in the company. The cottages need a lot of attention, for example they must be oiled once or twice a year and during winter freezing is always the problem. In order to keep the houses mold-free and comfortable theyr temperature is minimum 15°C during the winter months!